Just LOOK at that. 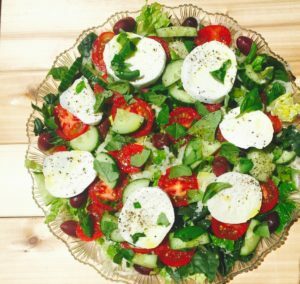 I was inspired to make this Caprese Salad when we dropped into a shop in the hamlet of Coe Hill, a little bit south of Bancroft, Ont., the other day. It’s new, and it’s called The Barn Chef. The couple who owns it, Sara and Luca (who is Italian), have been chefs all over the world, and have settled in lovely Coe Hill. They make almost everything they sell, including cured meats, jams, breads and cheeses, using local ingredients. One thing they don’t make in-house is the buffalo mozzarella; Sara told me it’s made in the Montreal area by “an old Italian guy,” using, of course, buffalo milk. I can’t resist buffalo mozzarella, so brought it home (along with their homemade focaccia bread) and made this fantastic salad. Nothing could be easier; throw some washed leaves on a plate (I used romaine and spinach). Top with fresh local tomatoes–the greenhouse kind are available from Ontario right now and they’re pretty good–shaved fennel, sliced cucumber, etc. Just use what you have in the fridge; I had some Kalamata olives to throw on. Then, top with the sliced mozzarella and fresh basil leaves. Drizzle on some good olive oil and the juice from half a lemon, add salt and pepper–and get your fresh focaccia ready for mopping it all up.